A few years ago, we had dinner at a Spanish restaurant in Liverpool. It was a little disappointing, but the one thing I remember clearly was that I decided to follow the hints on the menu and ordered a glass of fino sherry instead of the usual wine. It was a complete revelation – chilled, bone-dry, delicate and ethereal. Everything I thought sherry wasn’t supposed to be, I suppose, raised as I had been surrounded by a million myths about sherry (sweet, old-fashioned, something for Grandma at Christmas, sticky, warm, etc, etc). I couldn’t quite believe just how good that fino was. It was a little epiphany in a glass. The way that people think about sherry is changing fast. That dusty and fusty image is dissipating rapidly as more people start to taste real sherry and not the approximations that nearly destroyed the drink’s reputation in the seventies and eighties. The one thing that I think is important to understand right from the start is that sherry is not necessarily sweet. In fact, most of it isn’t. Broadly speaking, the styles of fino, manzanilla, amontillado, palo cortado and oloroso are dry, and pedro ximenez and moscatel are sweet. Some of the best finos are among the very driest wines produced anywhere in the world, so the ‘sweet and sticky’ label is largely unjustified, and the result of inferior blends created to cater for particular tastes – the stuff that nearly destroyed the style and took the industry with it. So, there’s more to sherry than that dusty bottle rammed into the back of your parent’s kitchen cupboard. It’s a whole new world, and Talio Baiocchi’s book, Sherry: A Modern Guide to the Wine World’s Best-Kept Secret, with Cocktails and Recipes, is a superb introduction to it. Baiocchi presents an in-depth and well-researched insight into the history, style and method behind sherry production, covering the various styles and their relative merits, as well as describing how the terroir, or the landscape and environment of a particular corner of southwest Spain is so important in producing the particular character of these great wines. At its most basic, sherry is a wine fortified with extra alcohol, usually brandy, and blended and aged carefully. This whole process is mysterious and intriguing, and shaped and influenced by everything from the particular mix of base wines, the way in which they’re handled, the barrels in which the sherry is stored, the exposure or not to natural yeasts and air, the climate of the region, and even the particular microclimate of the bodega in which the sherry is stored. A wine cave with sight of the Atlantic is much prized for the magic of the stiff sea winds and the effect they have on humidity and temperature, for example. Baiocchi’s book answers three essential questions – what is sherry, where did it come from and what should you do with it? The first part addresses the various wines on the spectrum of sherry and how they’re made, covering each of the styles along with a detailed look at the towns of the ‘sherry triangle’, an area centred around Jerez in the very south of Spain, and the particular producers and bodegas in these towns. 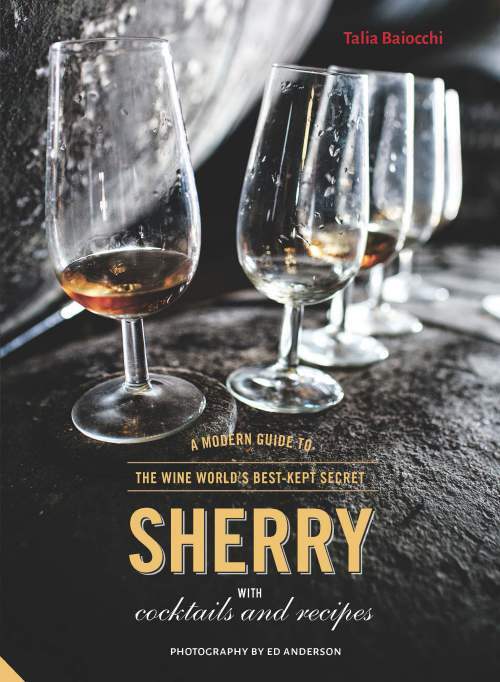 The middle section describes – with some excitement – the current sherry renaissance, and how sherry has and is finding a new audience, and the latter parts of the book cover sherry cocktails and food pairings. It isn’t often that I find myself reading a book about something in which I’ve only had a passing interest in the past from cover to cover, and enjoying doing so quite so much. This is a captivating and easy read, that doesn’t have a sniff of the stuffiness formally associated with the drink it covers. And finally, just flicking through the ubiquitous list of stockists and suppliers, I notice that there’s a list of bars renowned for their range of sherries, that includes Ambiente, a tapas restaurant in Leeds. Might have to go and investigate further.